Part of a community of 26 beachfront homes, the cottage at 137 West Beach Drive in Stratford directly overlooks Long Island Sound. It's close enough that the current owners installed a spot to hold fishing poles, so they could fish right off their deck. The 1,257 square-foot home not only has a spectacular view, it also has an open floor plan, offering a spacious living area, as well as large kitchen. Though it was built in 1923, it's been remodeled over the years and has all the amenities of a modern beach house. STRATFORD — There was a time when the 26 houses in the West Lordship Beach Association were nice places to visit, but you wouldn’t want to live in them. Well, maybe you would want to live in them — but if even if you did, you couldn’t. In addition to living in the neighborhood, Curcio is the listing agent for one of the homes there, at 137 West Beach Drive. Built in 1923, the 1,257-square-foot cottage is listed at $424,701, and is unusual among the neighborhood’s waterfront cottages, Curcio said. Whereas most of the other houses are clustered close together, 137 West Beach is kind of off on its own, offering some privacy. It also sits directly above Long Island Sound. It’s so close to the water, in fact, that the current owners installed a place for fishing poles, so they could fish off the deck. The home offers a clear view across the Sound, and Curcio said she often sees the Port Jefferson ferry traveling back and forth across. 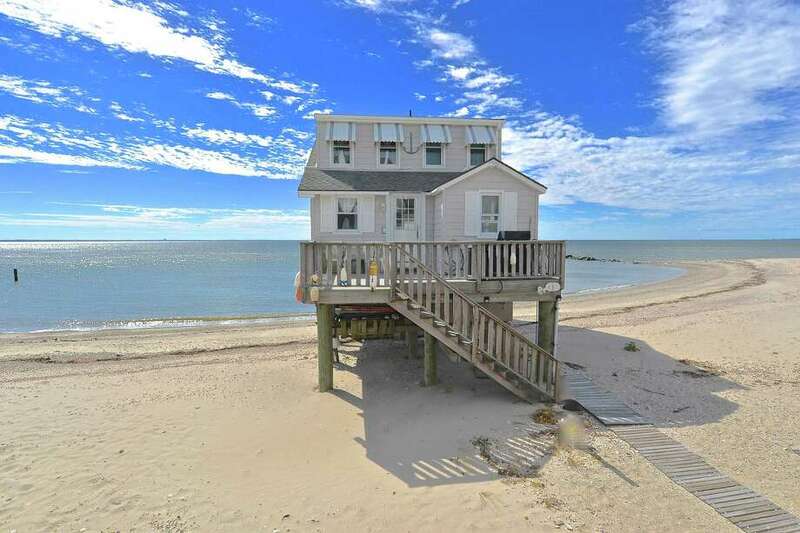 Though adjacent to Long Beach, one of Stratford’s public beaches, the West Lorship Beach Association cottages sit on several acres of private beach, which the residents share. “There’s nothing better than waking up on the water,” Curcio said. “And there’s lots of wildlife,” she said, adding that she’s seen a few snowy owls lurking in the area. Despite being nearly a century old, 137 West Beach has been updated over the years to have a modern feel that includes an open-concept living room that opens up to the deck overlooking the Sound. Of course, there are still old-school touches, and Curcio’s favorite are the kitchen cabinets. Though she said they’ve been painted a few times — right now, they are a bold avocado green — there is still something charmingly nostalgia-sparking about them. “This is just a great, old cottage kitchen,” Curcio said. The house has three bedrooms, all on the home’s second floor, and Curcio said the smallest bedroom (which could be used as a guest room or a child’s room) has one of the best views of the water. There are also two full bathrooms, and a main-level laundry room. Curcio said the house is good both as a year-round residence or as just a summer beach home. “It’s just in a good spot,” she said.